Bjarke Ingels, founder of BIG with Frank Jensen, Lord Mayor of Copenhagen. Photo: Christoffer Regild. On 4 March officials from the City of Copenhagen, local community members and the design team gathered to celebrate the start of construction of Amager Bakke (Amager Hill), the new waste-to-energy plant replacing the by now anachronistic Amagerforbraending plant next to the site which recovered energy from waste for the city and its region for more than 40 years. Amager Bakke waste-to-energy plant, Copenhagen, BIG. © BIG/Bjarke Ingels Group. Amager Bakke waste-to-energy plant, BIG, © BIG/Bjarke Ingels Group. Many other countries still dump waste at landfills or locate their waste-to-energy plants far away from heat markets. 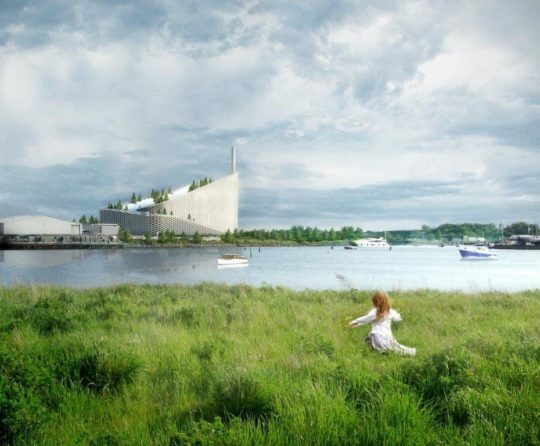 The Danes’ intention is to create an exemplary model in the field of waste management and energy production that integrates the latest technologies in waste treatment and environmental performance, and is also an architectural landmark in the cityscape of Copenhagen. Amager Bakke waste-to-energy plant, BIG. © BIG/Bjarke Ingels Group. 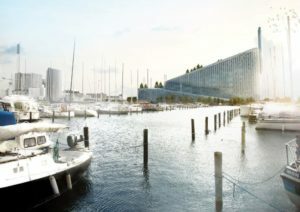 The €470m project, which will be the tallest building in Copenhagen when it is completed in 2016, is the single largest environmental initiative in Denmark, and one of the largest in Europe to be built in one go. It will meet the energy needs of 97% of the city’s homes with district heating and 4000 homes with power. With a porous facade made of planters, it is a ‘man-made eco system’, as Bjarke Ingels, BIG’s founder, calls it. It is located in one of two so-called ‘smart back yards’ of the city dedicated to technical installations, between Copenhagen and Amager, next to the marina, with housing on one side and factories on the other. Many other countries still dump waste at landfills or locate their waste-to-energy plants far away from heat markets. BIG invited Realities: united, the Berlin-based interactive designers to collaborate on the artistic accentuation of Amager Bakke’s function expressing pollution on the city skyline: the smokestack will puff a smoke ring equivalent to 1 tonne of CO2 has been released, and the rings will be illuminated at night by heat tracking lights. 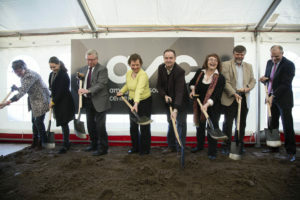 Groundbreaking ceremony for Amager Bakke waste-to-energy plant, with board of directors including the CEO Ulla Roettger and Chairman of the Board, Morgens Loenborg. Photo: Christoffer Regild. 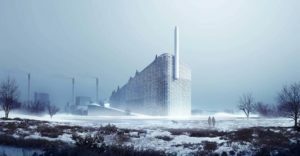 Reflecting the progressive vision for a new type of waste treatment facility that is not an isolated object, Amager Bakke is conceived as a destination in itself. Ingels calls Copenhagen ‘a city without any kind of topography continuous sloping roof is conceived as a public ski slope for varying skill levels, reached via an external lift system ascending past the smokestack, giving visitors a vivid sense of the daily function of the site. 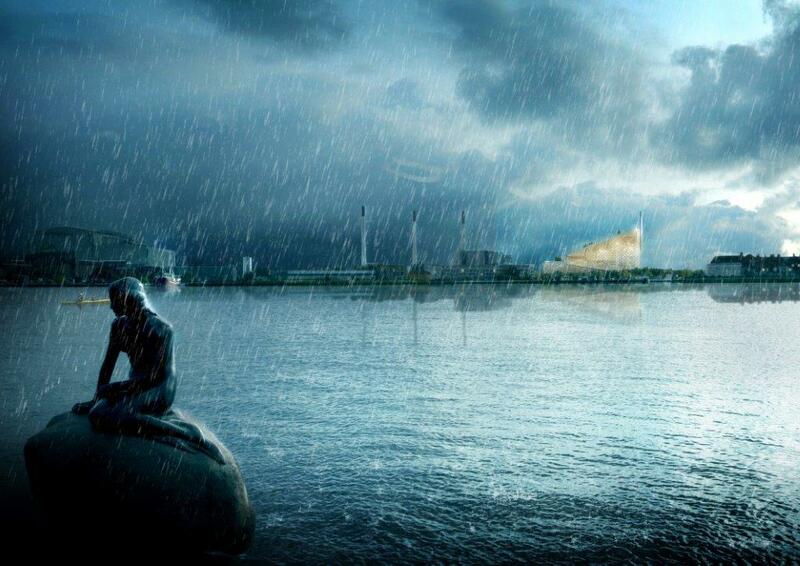 Amager Bakker waste-to-energy plant with Copenhagen’s mermaid in the foreground, BIG. © BIG/Bjarke Ingels Group. This recreational sports facility is aimed at the citizens of Copenhagen, neighbouring municipalities and tourists, redefining the relationship between the waste plant and the city. The project is a collaboration with Realities:united (interactive facade), AKT (facade and structural engineering), Topotek/Man Made Land (landscape architecture) and Glessner Group. Amager Bakke waste-to-energy plant from the marina, Copenhagen, BIG. © BIG/Bjarke Ingels Group. Amager Bakke is the first project to be realised from a bi-national, urban regional plan conceived by BIG called Loop City, encompassing the Øresund region encompassing the coastlines of Denmark and Sweden connected by a short bridge. This began when the ten municipalities of metropolitan Copenhagen asked BIG for a vision of Copenhagen in 2050, and the architects decided to mix all the different investments into a ring of regional urban space the size of 11km2, the size of the entire inner city of Copenhagen, with a light rail transport infrastructure spine of 20 highly differentiated urban nodes, with a smart grid and incorporating waste management plans, conceived as an artery of dense urbanity with one continuous green band. 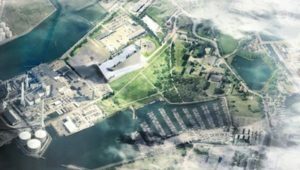 The scheme has enough development space to contain the growth plans of the region for the next 50 years, and could expand to the entire Øresund region through an extension of the light rail. The concept is conveyed with great clarity and expression in the video BIG made with Kollision about Loop City and its role in Copenhagen’s urban evolution from the post-war plans of the 1940s.